This ruler was designed to simplify cutting for patterns using 2 1/2" strips or 5" Charm squares. There are no extra measuring lines or numbers to distract you, and the extra-large gripper dots hold fabric firmly to prevent slipping while rotary cutting. The center line cuts 2 1/2" strips. The end lines cut 2 1/2" and 5" squares. The diagonal line squares up a half-square triangle. So, you might ask, why do I want this ruler added to my stocking? Here's a good example of the value of this product. I have been actively working to "cull the herd" with my collection of fabric that has accumulated over quite a few years of sewing and quilting. Of course, working at a quilt shop doesn't help put the brakes on the collecting! But I have made progress in keeping within the limits of the storage space that I have for fabric. In order to do this, I routinely pull out fabrics that are no longer on the top of my "desirable" list, and I cut 1or 2 strips and several 5" squares from the yardage. Then I put the remainder in a big plastic bag attached to my cutting table and when it gets toward full it is passed on to another person who makes good use of those pieces. The boxes in the picture above are all full of 2 1/2" strips and 5" squares that are ready for a rainy day. Might need a monsoon to get through all of them! 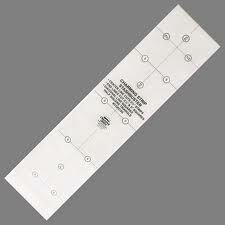 But my point is, this Stashbuster ruler is just the ticket for making the job easier. And I get to hold onto some neatly organized pieces of fabrics that were once near and dear to my heart, but I don't have to store the whole hunk any longer! Give it a try--it's a good thing!